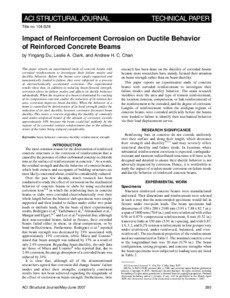 This paper reports an experimental study of concrete beams with corroded reinforcement to investigate their failure modes and ductility behavior. Before the beams were simply supported and monotonically loaded to failure, they were subjected to a process of electrochemically accelerated corrosion. The experimental results show that, in addition to reducing beam flexural strength, corrosion alters its failure modes and affects its ductile behavior substantially. When the response of a beam is dominated by cracking of its compression concrete and/or the reduction of its tension bar area, corrosion improves beam ductility. When the behavior of a beam is controlled by deterioration of its bond strength and/or the reduction of its steel ductility, however, corrosion decreases beam ductility. This raises a concern regarding the ductility of commonly used under-reinforced beams if the amount of corrosion exceeds approximately 10% because the beam could fail suddenly by the rupture of its corroded tension reinforcement due to the ultimate strain of the latter being reduced considerably.